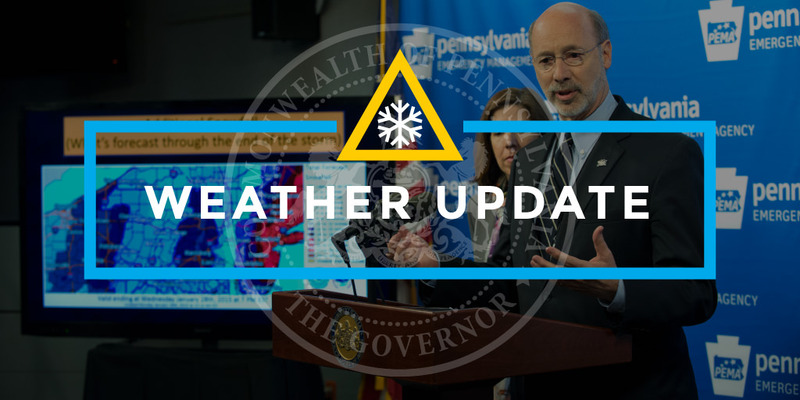 Harrisburg, PA – With an intense winter storm expected to bring heavy snow, high winds, sleet and freezing rain across the state through this weekend, Governor Tom Wolf today signed a state of emergency declaration to allow for increased assistance with storm-related needs. The commonwealth also will impose speed restrictions and a ban on all commercial traffic, including buses on most interstates and the Pennsylvania Turnpike. State officials urge motorists to use caution during the storm, postpone travel if possible, reduce speeds and be aware of the potential for rapidly changing weather and roadway conditions. The commercial vehicle ban will be in place between noon Saturday and noon Sunday on all interstates and the Turnpike, except for Interstate 95 in southeastern Pennsylvania. The ban will also be imposed on the U.S. 22 expressway in the Lehigh Valley and the Pennsylvania Route 33 expressway in Northampton and Monroe counties. See a map of restricted roadways. The declaration of an emergency allows for additional help from neighboring states and standing up the Pennsylvania National Guard to ensure a swift response to possible changing priorities, and the vehicle bans will allow our snow plow crews to have a clearer route to keeping these interstates open despite the expected severe weather. The governor’s emergency declaration authorizes state agencies to use all available resources and personnel, as necessary, to cope with the magnitude and severity of the storm’s impacts. The time-consuming bid and contract procedures, as well as other formalities normally prescribed by law, are waived for the duration of the proclamation. It is important to note that the declaration does not restrict citizens from travel on commonwealth roadways, but motorists should be aware of any restrictions that are in place and heed the guidance of local authorities. Speed limits will be restricted to 45 mph on the interstates and expressways as the storm progresses. The Pennsylvania Department Transportation (PennDOT), the Pennsylvania Turnpike, the Pennsylvania Emergency Management Agency (PEMA) and the Pennsylvania State Police have been coordinating their planning in advance of the storm and will be staffing the Commonwealth Response Coordination Center (CRCC) throughout the duration of the storm. Anticipating the storm’s severity, Amtrak has already cancelled the cross-state Pennsylvanian passenger train for Sunday and has cancelled six trains Sunday on the Keystone Line between Philadelphia and Harrisburg. A vehicle emergency kit should be prepared or restocked with items such as non-perishable food, water, first-aid supplies, warm clothes, a blanket, cell phone charger and a small snow shovel. Motorists should tailor their kits to any specific needs that they or their families have such as baby supplies, extra medication and pet supplies. The CRCC at PEMA headquarters outside Harrisburg will be activated at 8 a.m. on Saturday and staffed with personnel from multiple state agencies, including the departments of Transportation, Conservation and Natural Resources, Environmental Protection, Fish and Boat Commission, Game Commission, General Services, Health, Public Utility Commission, Military and Veterans Affairs, Health, PA State Police, Human Services, Revenue, and PA Turnpike, as well as the American Red Cross and Civil Air Patrol. Other state agencies are on notice to report if needed. PEMA works with county emergency management personnel to monitor unmet local needs during inclement weather affecting travel, utilities, and shelter. You are encouraged to monitor state agency social media accounts for the most up-to-date information on any emergency or weather-related situation affecting the state, in addition to any social media accounts for your local emergency management offices. In addition to driving safely around plows, motorists are urged to drive according to conditions. If motorists encounter snow or ice-covered roads, they should slow down, increase their following distance and avoid distractions. Last winter in Pennsylvania, preliminary data shows that there were 440 crashes resulting in 221 injuries on snowy, slushy or ice-covered roadways where aggressive-driving behaviors such as speeding or making careless lane changes were factors. To report an accident or other emergencies on the PA Turnpike, dial *11 on your mobile phone. If there is an accident, move the car out of travel lane and onto shoulder, if possible, and stay in the vehicle. For more information about PA Turnpike conditions, follow the conversation by using www.paturnpike.com/travel/twitter. You may also see advisories by clicking on the travel ticker on www.PATurnpike.com. PennDOT has created a Winter Safety media center, including social-media-sized graphics highlighting winter driving preparations and operations at www.penndot.gov in the “Media Center” under the “About Us” footer. For more information on safe winter travel, an emergency kit checklist and information on PennDOT’s winter operations including a video, visit PennDOT.gov/winter. Additional winter driving and other highway safety information is available at PennDOT.gov/safety. Follow the conversation by using #PAWinter on Twitter at www.twitter.com/PennDOTNews and visit the department on Facebook at www.facebook.com/PennsylvaniaDepartmentofTransportation to view a winter emergency kit video.